At Alcamé, we understand the desire to feel and appear at your best everyday. Having great looking hair is a big part of that overall feeling of confidence and well-being. Our goal is to deliver products that provide a consistent, premium experience that leaves one feeling fabulous. That’s why Alcamé hair care products have been expertly crafted to ignite and engage the senses while transforming the hair. We have scoured the Earth collecting indigenous ingredients with natural benefits and paired them with decades of hands-on experience. 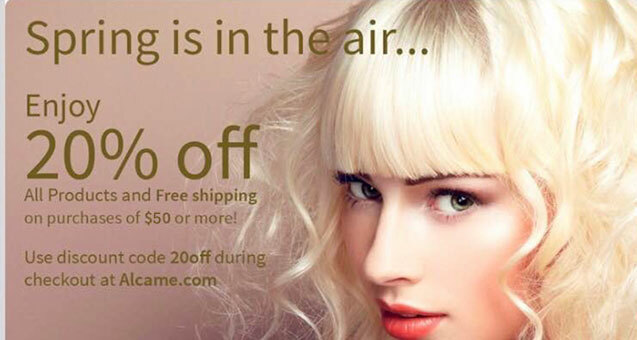 The resulting hair care products offer exceptional performance and consistent results. Come find out more about The Alcamé Experience. Safer. Milder. Sulfate free. No artificial colors. Attracting new clients is getting harder. Over the last few years with social media the market is even more competitive, with salons chasing an ever elusive pool of prospects. Yet the ultimate success and strength of your hair business depends almost entirely on your team, the products they use and their ability to perform consistently. This includes what your stylists send home with your customers. Alcamé is a pioneering brand with artfully crafted formulations that provide the quintessence of deep-rooted knowledge and scientific progress. Utilizing state-of-the-art research and development along with next-generation chemistry, we blend the finest grades of certified organic ingredients with advanced actives into innovative formulas to cleanse, nourish, preserve and protect the essential beauty and overall wellness of the hair and scalp. Our philosophy echoes the spirit of those who led the way before us, inspired to bring enthusiasm and loyalty to this artful profession with the love of service and a commitment to educating salon and spa professionals with honest knowledge about product ingredients and their performance. Appreciating the freedom of self expression that our profession provides to us each day. To expertly command the tools that create the look. The development of inner vision one must possess to have an awareness of what’s next. Alcamé is with you all the way. Nourishing fruit butters from Africa, soothing seaweed from the oceans, healing herbs from the rainforests, beneficial oils from Italy, vitamin enriched fruits from the Islands, lavender and grape seed from France, teas from Asia. Nature’s offerings gathered from around the globe infused into our distinct formulations make it easy for specialized professionals to offer their clients — the best of all worlds. Click the button to learn more about some of the specialized ingredients, complexes and blends utilized throughout the entire Alcamé Collections. Join the Alcamé mailing list and we will send you styling tips and product promotions to help you get the most out of your Alcamé experience. If you are a Salon, please use the button below to contact us. Your Message Has Been Sent! Thank you for joining.